We invite you to experience body and hair care products that contain natural herbs and oils from Native American healing traditions that go a long way back. Here at the Red Arrow Inn and Suites we take pride in offering our guest sustainable amenities that support the economic growth of our country and culture. Supporting a company such as Sister Sky not only do we have a chance to provide superior products to all current and future guest, but we are giving back to where we started by paying homage to our Native American culture here in Montrose, CO. We are proud to offer their Sweet Grass Natural Bath Products line, that is inspired by nature and the wisdom of their heritage. 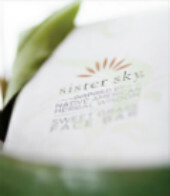 You will find a full line of Sister Sky amenities in each guest room. If you love them like we do, make sure to stop by the lobby and get the full size bottle to take home with you. A clean, fresh fragrance with green herbal notes.